After spending the day privately with her children while the Duke of Cambridge was handing out the shamrocks at Aldershot Barracks yesterday, HRH The Duchess of Cambridge, who is the Royal Patron of East Anglia’s Children’s Hospices, was on hand to officially open a brand new EACH charity shop in the North Norfolk town of Holt today. 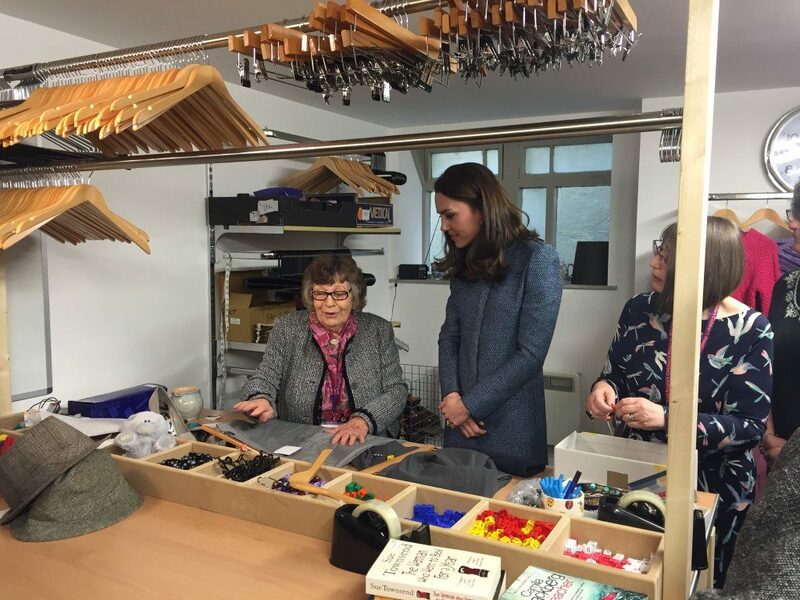 Before the ribbon cutting, The Duchess received a tour of the shop, while meeting a number of staff, families and supporters, including seven EACH shop volunteers with a combined service of more than 130 years. 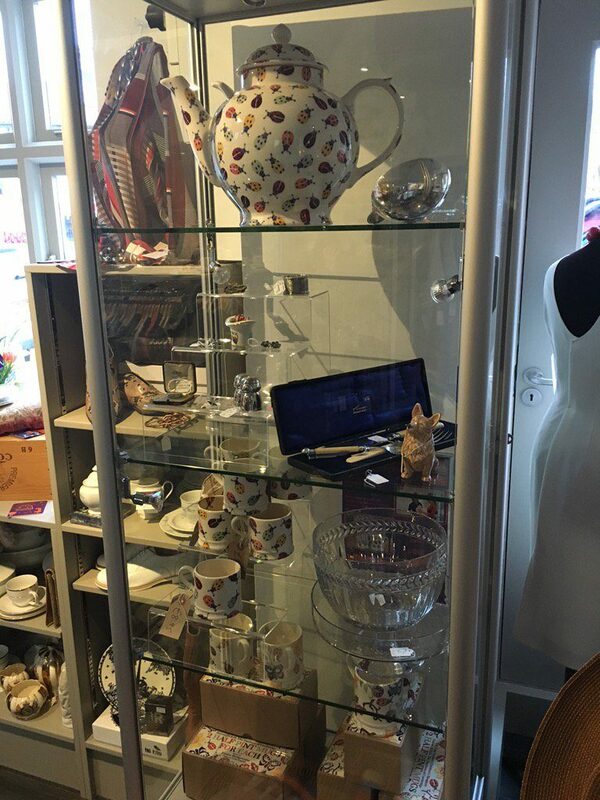 One display that readers are likely to recognize is that of the Emma Bridgewater pieces that the Duchess had a hand in designing. They are still available here if you want to get one or a set. They have also released two shopper bags that benefit the charity and you can get those in either the ladybug or flower designs for £5 each so why not snap up both. Holt will be the 21st shop in the organization’s retail portfolio and forms part of ambitious plans to expand their network of shops over the coming years. 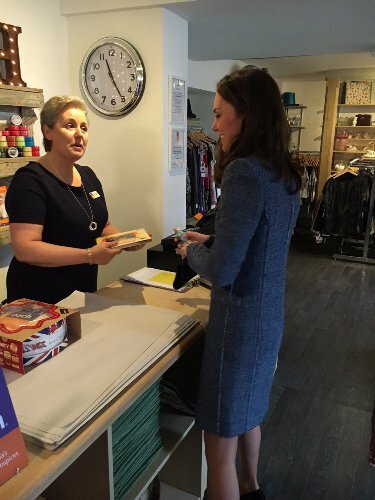 Tracy Rennie, EACH Director of Care said: “We are delighted The Duchess of Cambridge will be taking the time to help us celebrate the opening of our new shop in the beautiful town of Holt. “We’re really looking forward to becoming an integral part of the town’s thriving and friendly community, and are confident local residents will help us make the shop a great success. It’s really important for us to have a strong presence in North Norfolk; an area in which many EACH families live and where our specialist staff deliver so much care and support. EACH relies on voluntary donations for the majority of its income and this year alone need to raise £2.5 million from their retail activities and a further £5 million from fundraising. Sam Lucking, EACH Director of Income Generation said: “Our shops simply couldn’t survive without the hard work and dedication of our volunteers, and we urge anyone interested in joining our friendly team to get in touch. We need lots of new customers and regular donations too! The shops rely on donations of clean and high quality goods to sell, including clothing, bric-a-brac, books, toys, jewellery, DVDs/CDs, household linens, retro and vintage clothes and small electrical items. They also welcome donations of good quality furniture and can collect it free of charge if you’re unable to transport it yourself. More than 700 children, young people and family members are currently receiving care and support at EACH, including over 300 from EACH’s hospice at Quidenham in Norfolk. More than half of their care and support is delivered in the family home and community, including North Norfolk, in surroundings familiar and comfortable for the family. Since becoming Royal Patron in 2012, The Duchess of Cambridge has played a vital role in raising awareness and understanding of children’s hospice services, across East Anglia and the rest of the UK. The Duchess of Cambridge is a devoted mother of two but volunteers to support charities helping families and children. It is sad people criticize when she can’t be in two places at once. Blessings to for her & the wonderful work she sponsors. she certainly has a balancing act to do, and you can see that she is passionate about the causes that she gets behind.